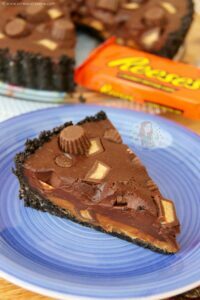 A No-Bake Peanut Butter Pie with an Oreo Crust, Peanut Butter Layer, Smooth Chocolate Ganache Filling, and Peanut Butter Cups! 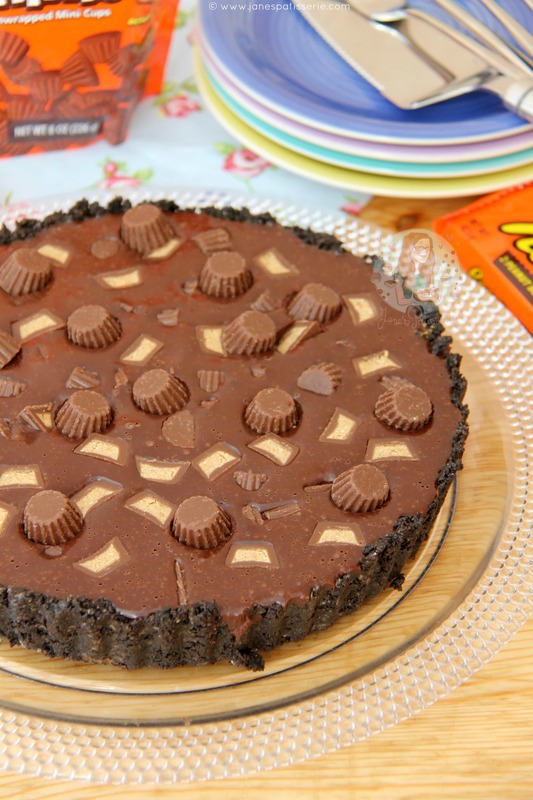 Ever since the rise of my No-Bake Rolo Tart, I knew I had to create a similar version… but with Peanut Butter. This is partly because I have had SO. MANY. requests for a Peanut Butter version that I can’t actually cope, and partly because I think it would be damn tasty. I realise that there are other recipes for this out there, but I have purely based this on several of my recipes. 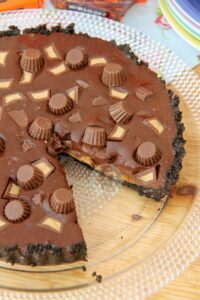 I decided to use the base and idea from my No-Bake Rolo Tart, the chocolate filling from my No-Bake Biscoff Tart as I prefer it as its not as hard, and well.. its honestly delicious or so I have heard. *I can’t eat peanuts* but I know this works as my Trusty Taste Testers agreed tenfold. 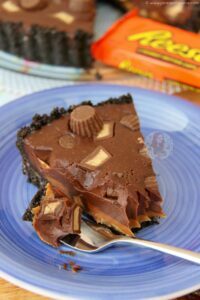 This is something you can easily change up if you wanted… You could add an extra 100g of peanut butter to the chocolate mix and whisk in, and leave to set normally. Or you could use Digestives as the biscuit base, etc. There are so many things you could easily change up and do so that you like it yourself! I bought my Peanut Butter Cups from Tesco, but you can buy them in quite a few places now! Reese’s Pieces will also be a great decoration, but I didn’t have any of these as someone mysterious ate them. But either way, any peanut butter related sweets and you’ll be there! Enjoy! 1) For the Oreo Crust – Using a food processor, blitz all of the biscuits to a fine crumb, and mix in the melted butter. Press this into the sides and base of a 23cm Pie/Flan tin (mine was 3cm deep). It might be easier to use your hands and fingers for this! Make sure that the side parts are thick enough to hold once removed. Refrigerate for now. 3) Once hot, pour over the chocolate and butter and whisk until smooth! If the chocolate hasn’t fully melted by this point, heat it in the microwave in 10 second bursts, stiring every time – but give it a chance by whisking first as the whisking will help melt the chocolate. 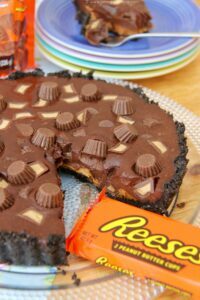 4) Once the mixture is smooth, spread the Peanut Butter onto the bottom of the Oreo base (it might be worth heating it for 10 seconds in the microwave so its easier to spread). Once on, pour the chocolate mix on top. 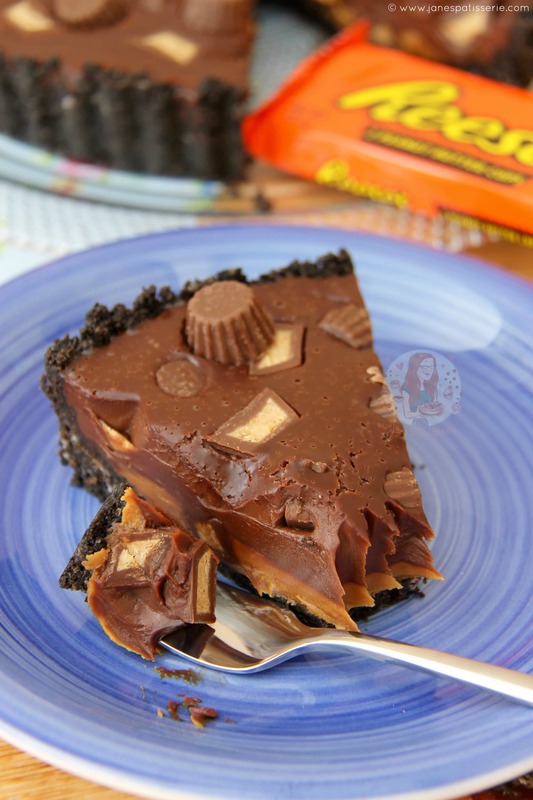 5) Add the Peanut Butter Cups to the top like you can see in my pictures and sprinkle on your sprinkles. Leave to set for 3-4 hours, or overnight. 6) Carefully remove from the tin, and enjoy! Serve with a dollop of cream, or on its own – yum! I use Callebaut Chocolate in my bakes, but any good quality chocolate will work fine! I used a mixture of dark & milk chocolate in this dessert as I love the chocolatey combination it creates, but you can easily use all of one or all of the other! Older Next post: Toblerone Brownies! Newer Previous post: Biscoff Rocky Road! Mine came out soupy and never became solid. Where did I go wrong? I’m afraid I wouldn’t know without seeing what you did.. chances are you overheated it quite considerably. Which peanut butter cups did you use, to garnish the top of the pie, with? minatures, or minis?